Inkjet printers are the most common type of printers used for offices and home computing alike, which means printer ink cartridges make up a large part of Sandia Office Supply’s inventory. 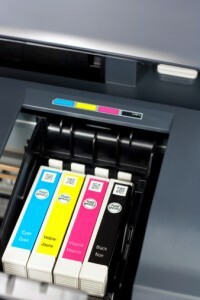 We carry all major brands of computer printer ink cartridges to keep your printers and your business humming. We also carry Sharp, Kodak and Xerox printer ink cartridges for photo and specialty printers, and we offer discount, remanufactured printer ink cartridges by Elite for most HP printers. Sandia Office Supply offers earth-friendly products, including printer ink cartridges. To see our entire selection of green office supplies, check out our Green-Only Catalog. In addition to promoting environmental stability, we also support economic sustainability—yours and ours. As New Mexico’s largest local office supply store, Sandia Office Supply employs 33 full-time employees, all with the same goal: to help you save time and money. Together, our knowledgeable staff has over 450 years of experience in the office supply industry, and we are happy to share our expertise with you. Contact us to open an account with Sandia Office Supply today and have your personal customer service representative meet with you to find ways to save on office supplies, furniture, breakroom supplies and much more! Call 505-341-4900 to order your printer ink cartridges from Sandia Office Supply of Albuquerque, NM today!